On Wednesday, September 26th, I gave a talk about ‘Decoding The Black Box’ at the Frankfurt Data Science Meetup. My slides were created with beautiful.ai and can be found here. We will have this evening as our guest - Nicole Tschauder, who works as a Manufacturing Analytics Expert at SAS. She focuses on the use of ML in production, logistics and other IoT scenarios. From her background Nicole is a mathematician. In order to transform gigantic IoT data flows into usable insights, two things are key: The right technology to obtain sensor data and functioning analytical methods to analyze data either at the edge or in-stream. During this presentation, Nicole will give an introduction to new methods that are specifically tailored to the analysis of sensor data. 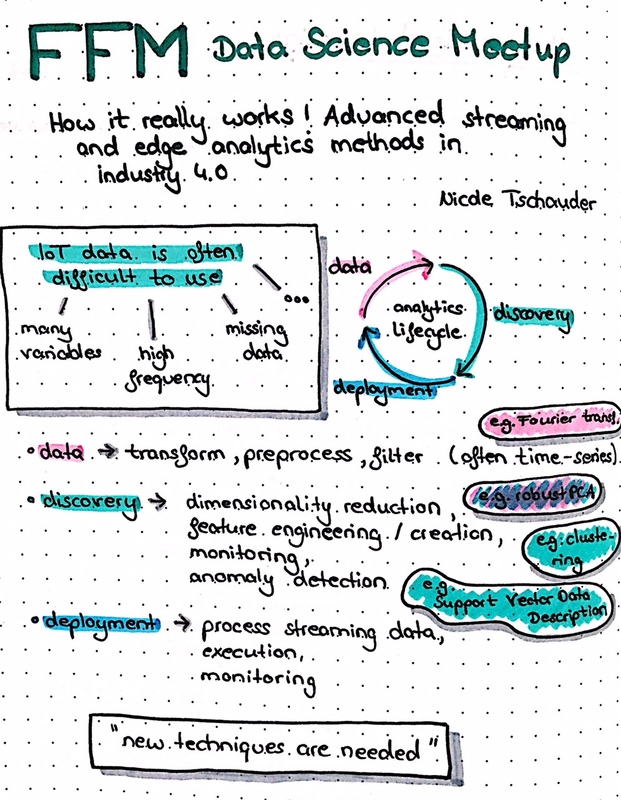 You’ll learn how that is different from classical analytical methods and how to apply the knowledge in areas like predictive maintenance, anomaly detection or signal processing.